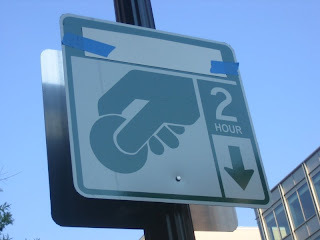 In a previous post, I told you that the parking meters would be in operation from 8am – 7pm. 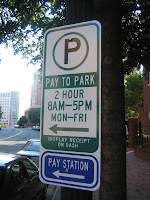 I based that on the information that is on the parking meters themselves. Well, I was wrong. The official word from the City is that the official time the meters will be in operation is from 8am – 5pm Monday thru Friday (see enclosed photo of sign at left). I do know the meters have not been turned on yet as the vendor is waiting for a part. The expected start date is Wednesday or Thursday. A reader emailed last week to say that the PTO had approached the City Manager Jim Hartmann about lifting the two hour maximum time. I am told that this request was declined. The PTO were told that they have to pay just like everybody else. 1. Insert coins (quarters or dollar coins) or credit card (Visa, Master Card, or Discover). 2. To add time, add more coins; if using a credit card, press the corresponding buttons. 3. Next, push the print button for a receipt. 4. Finally (This is IMPORTANT! ), place the receipt face-up on the dashboard of your car.